Joy Creek Photo Archive (c) all rights reserved California. Our native Grass widows do a fine job of beautifying the garden in the spring, but once warm weather arrives, they tend to brown out and go dormant. 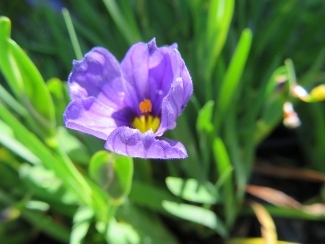 Sisyrinchium bellum `Rocky Point; is a dwarf version of the species introduced by Native Sons Nursery in California and has the advantage of being semi-evergreen and of blooming throughout most of the summer. We grow it at the edge of a woodland border and have been impressed with the show. Spring to summer. 3.5 in. x 5 in.